Seascape is designed by Peddle Thorp, one of Australasia’s leading architectural firms. The resulting design is a significant achievement and the first of its kind in Australasia. Seascape is a design collaboration between developers, Shundi, and Peddle Thorp, one of Australasia’s leading architectural firms. Together they have undertaken the redevelopment of this prominent corner site which includes two existing buildings: Ballantyne House – which is being converted into a boutique hotel - and the heritage building formerly known as the Britomart Hotel which will be extensively refurbished. Seascape stands an impressive 187m high. 48 of the 52 total floors are occupiable (not including the 5 levels of basement parking). The podium occupies the bottom 7 floors. On the ground floor, the double-height Grand Lobby travels the full width of the building from Custom Street East to Gore Street Lane where the entrance to the Apartment lobby is located. The ramp to the basement parking and the VIP car lifts are also accessed from Gore Street Lane. There are retail tenancies on the ground and first floors, with two levels of VIP parking then two levels of offices above this. On Level 7, there is a stunning pool with fitness room and changing facilities. The main volume of the tower is comprised of 4 apartment types with Sub-penthouses and Penthouses from Level 41. 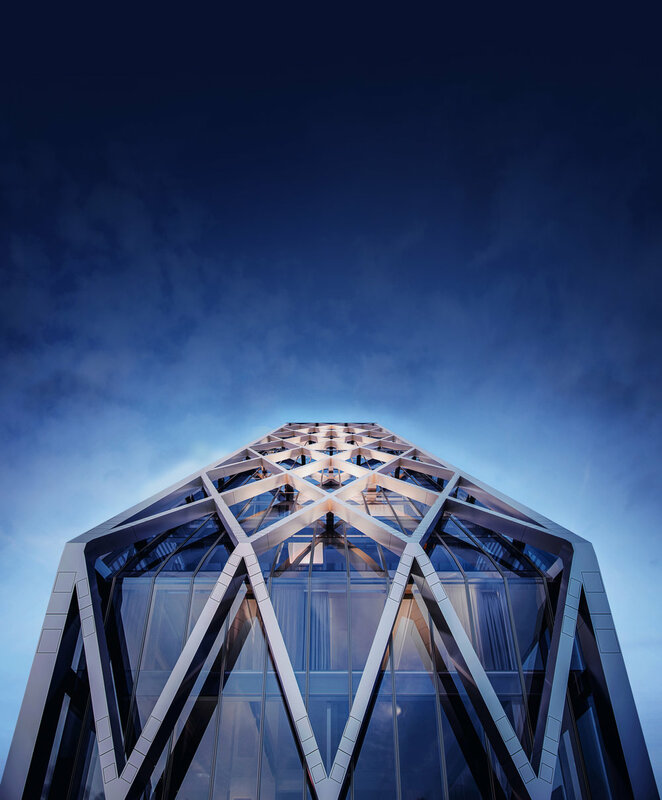 Seascape’s soaring glass façade is an ambitious architectural feat that has required a close collaboration between developers, architects, engineers, and contractors. The design outcome is a significant achievement and the first of its kind in Australasia. To achieve the client’s desire to have clear unobstructed views from each apartment, the tower incorporates an external, structural steel mega-frame, braced in a diamond lattice, that runs the full height of the eastern and western sides of the building with an innovative distributed viscous damping system running up the core. This innovative engineering solution has become an integral part of Seascape’s iconic architectural design. Seascape strikes a dramatic silhouette against the Auckland Skyline. Its structural megaframe is both an engineering innovation and an iconic design feature. 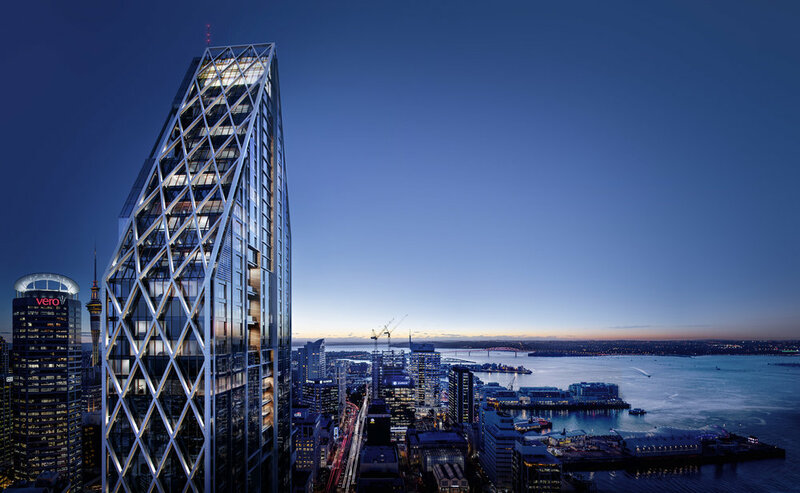 Seascape is part of a city-wide boom of ultra-tall buildings in Auckland that will reshape its city skyline and provide a new level of glamour to the CBD. With such a significant site and commanding height, this unique project demands a special design. The elegant shape of the tower is part form and part function. The angular lines at the top of the building were a considered response to achieve the maximum height but still comply with shading controls for nearby Emily Place, while the asymmetric apex gives interest and complexity to the design. This dynamic shape is enhanced by the simplicity of the glass façade and the sculptural quality of the lattice megabrace. With the Grand Lobby and the Hotel Laneway both connecting Custom Street East to Gore Street Lane, the ground floor has been designed to activate the surrounding streetscape and integrate the building into the urban fabric of downtown Auckland. The 7-level podium has been designed to complement the scale and look of surrounding character buildings with vertical openings inspired by local heritage architecture. The grain of the original buildings on the site – identified through historic photos – have been used to articulate the Custom Street façade. These bands run up the entire front of the building, broken only by the pool level at the top of the podium, providing an urban scale to the design and a conceptual link to the historic streetscape.